With transcription reports getting repetitive eventually leaving you lesser time to create reports, outsourcing ENT Transcription becomes an inevitable option. Also, with malapropism becoming a perineal challenge, there is a strong urge to bring collaboration between intelligent voice recognition tools and human transcriptionists. By choosing experts like us with 20 years of experience, your ENT transcription needs can be fulfilled with ultimate precision. Outsource2india is an ISO certified ENT transcription services provider. We have a strong backing in terms of technology and skilled transcriptionists who can take care of front-end speech recognition and back-end speech recognition by being hindered by ENT terminologies, varying accent, or other challenges that impact the accuracy of ENT report. 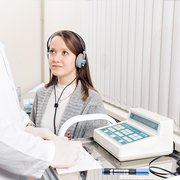 Additionally, we also provide Otolaryngology reports transcription to serve a wider market across the healthcare industry. When you outsource ENT transcription services to Outsource2india we take ENT dictations by a call-in dictation system, PC microphone, or Dictaphone. By using a speech recognition software, we accurately interpret your dictation style and ENT jargons before proofing the data. Why Choose Outsource2india to Offshore ENT Transcription Services? Being an industry leader among medical transcription companies, we have earned ISO 9001:2013 certification for carrying out ENT transcription according to regulations of the international organization for standardization. We take pride in being HIPAA-compliant for executing ENT transcription at the unparalleled quality. Outsource2india is an ISO/IEC 27001:2015 certified organization thanks to the effort taken by our team to maintain the confidentiality of your clinical scripts and documents that contain the detailed information about your patient’s condition. We also take security measures to make sure that data is not lost or compromised as we sign a non-disclosure to ensure our efforts are committed to keeping you safe from financial risks. We emphasize our efforts on delivering fully proofed verbatim transcriptions that are accurate and helps speed up the claims process. With deep knowledge of the ENT practice, we update our knowledge on the latest jargons and terminologies to provide high-quality reports that are helpful for seamless documentation and claims filing. We can provide you with high-quality reports that are consistent with the audio transcriptions provided from your end. Our TAT of 30% is considered as the best in the industry with a high rate of reimbursement and low rate of claims denial. Scaling your practice is now easy with our ENT transcription services because we have the team and technology resources to handle any volume of transcription needs. So we got you covered should you feel the need to process more patient encounters. You need not have deep pockets to avail our cost-effective services. O2I offers ENT transcription on a pay-as-you-go basis without any upfront cost. This helps you opt for a portion of the services that are ideally needed by your business rather than being forced to accept a comprehensive package. Why feel stressed being unable to contact the right person across the hierarchy when you can get a dedicated handler who will extend the best and personalized support to respond to your needs? Whether you want to clarify concerns or get service support or training we got you covered. We are a team of innovators who are on a pursuit to evolve our strategy to become better equipped at transcription services. By using efficient software our transcriptionists comprising of 200+ members will take care of the most routine challenges to help you secure quick reimbursement. We constantly upgrade our infrastructure (technology, security, and physical) to push the boundaries of quality services. With well-planned infrastructure, you can take the best step forward and keep your patients satisfied. We provide a secure ambit to send your data through FTP and VPN that is fully secured using latest IT security deterrents. We are available at your local time zone by phone, email, and web chat so that you can connect with us at a time of your convenience. Outsource2india is an ISO certified ENT Transcription services in India with service network spanning across 150+ nations. We offer the best healthcare BPO services that are known to be accountable and reliable to bring maximum reimbursements with a fewer chance of rejection. Our accurate transcriptions are achieved by experts with decades of experience and quality infrastructure that supports secure and error-free transcription. We also offer our services at unbeatable prices to save you from investing in comprehensive service. We also offer other services such as discharge summary transcription, neurology transcription, HL7 transcription, and more. Reach us now to get cost-effective and safe ENT transcription to get high-quality reports at quick TAT.